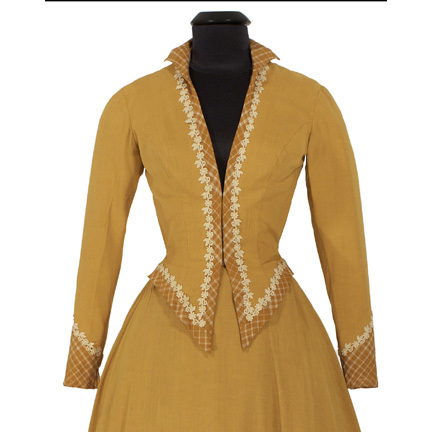 This two-piece Western costume was worn by the character “Karyl Orton” played by actress Donna Reed in the 1956 Western “Backlash”, also starring Richard Widmark. 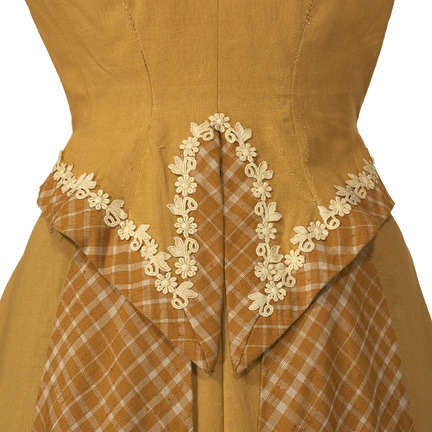 The costume consists of a yellow jacket with white lace and plaid trim at the neckline, collar, hem, cuffs, and matching floor length skirt. 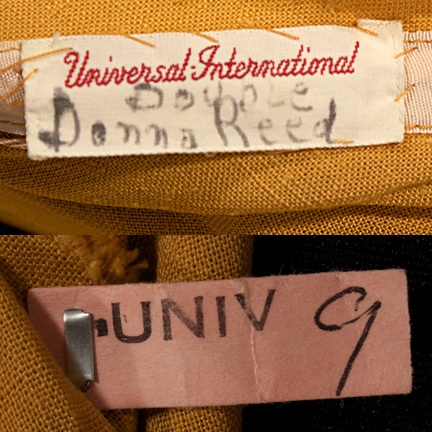 The jacket has the original Universal International label sewn inside with the name “Donna Reed” and “Double” handwritten in faded black ink (“Double” indicating that more than one outfit was worn by Ms. Reed during filming). The original tassels attached to the skirt tails were removed for use in a subsequent production. 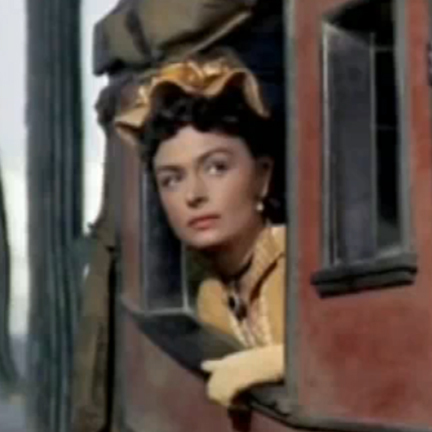 The actress wore this outfit with and without the jacket in several notable scenes near the beginning of the film. 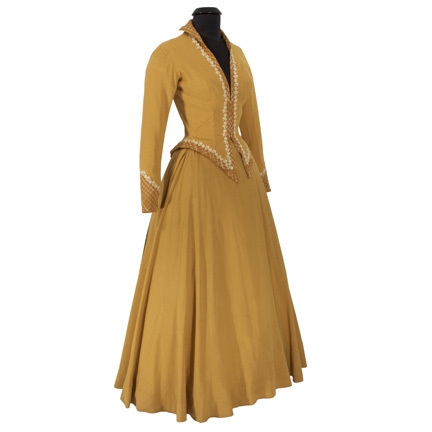 She first appeared wearing both garments while traveling by stagecoach and later when arriving at Benton’s Trading Post. 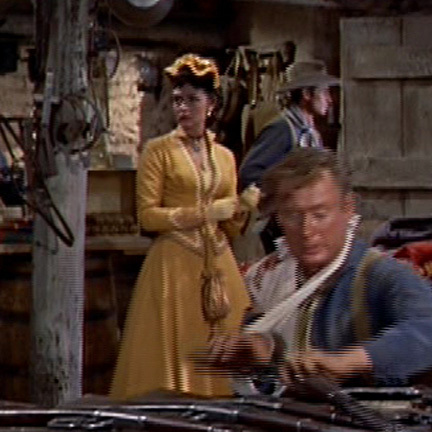 Once at the trading post she removed the jacket and wore just the skirt with a white blouse while remaining there overnight under protection from a possible Indian attack along with co-star Richard Widmark. 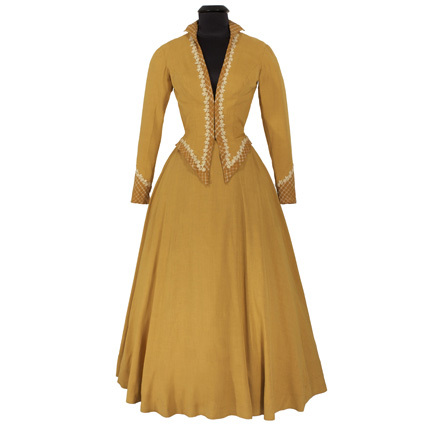 The wardrobe used in “Backlash” was created by designer Rosemary Odell, who worked on numerous other classic Western films such as “Gunsmoke”, “The Lawless Breed”, “Bend of the River”, and “Horizons West”. The costume is in good vintage condition with minor evidence of age and is accompanied by a letter of authenticity from the costume house. 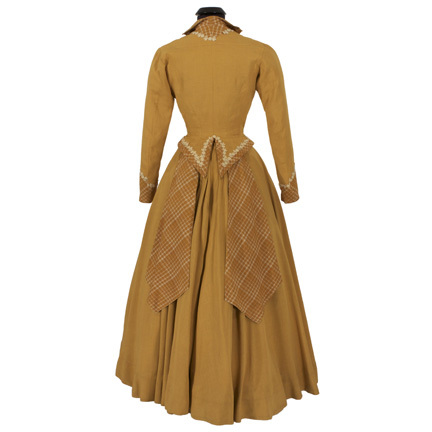 *Note: The petticoats beneath the skirt are not included in the sale of this item.